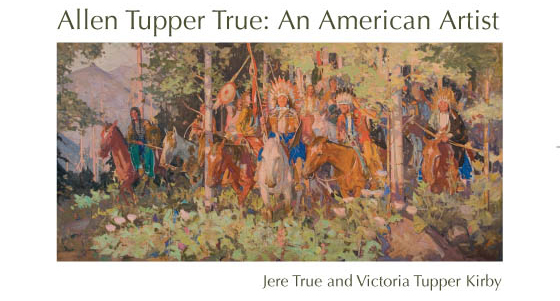 Allen Tupper True: An American Artist, by Jere True and Victoria Tupper Kirby and published by Canyon Leap, San Francisco, CA, in association with the Museum of the Rockies, Montana State University, Bozeman, MT, in 2009, is the first definitive biography of Allen Tupper True. 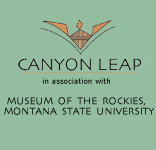 The book traces the artist’s life from his earliest beginnings in Colorado. The book relies on letters, diaries, and contemporary news accounts as well as family history to describe True’s artistic evolution from illustrator to easel painter to muralist of the first order. This biography is lavishly illustrated with 121 color plates and 81 black-and-white images. 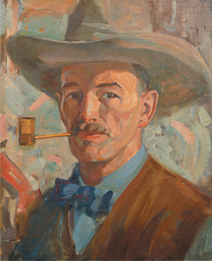 Allen Tupper True: An American Artist includes images of most of True’s murals (both extant and destroyed), a selection of his major easel paintings, as well as some of his sketches and cartoons and Indian-inspired designs, and photographs of True working and his friends, family, homes and studios. Written by True’s daughter Jere True and his granddaughter Victoria Tupper Kirby, the book has the charm of a personal memoir that is greatly enhanced by its scholarly underpinnings. The story of Allen Tupper True’s life and work is truly an American story that deserves to take its place in the panoply of American art history. True’s vision of the Western venture and peoples he so admired and revered is vividly brought to life in this biography. He painted a way of life that streaked across the American land and psyche like a shooting star: bright, brief, and unique. As long as True’s work exists, it won’t be forgotten. Allen Tupper True’s life was distinctly American. With roots deep in New England’s early settlement, he grew up in near-frontier conditions. His art work also is clearly American and decidedly Western in inspiration. He was an authority on Western cowboy gear, life, and costume, as well as a serious student and authority on Native American life, culture, and design. He had a deep admiration for these peoples and a keen interest in all the events and participants in the settlement of the West, including pioneers traveling across the plains, explorers seeking a practical way to the Pacific, trappers, practitioners of rough law, and miners. Through his own experience, he knew many of these elements; what he didn’t experience he studied, in person or in museums. It may indeed be said that any costume, piece of equipment, or artifact shown in his paintings is authentic. He studied extensively in this country, principally with the great illustrator Howard Pyle, and in Europe, serving an apprenticeship under the Welsh muralist, Frank Brangwyn. He became a master of his craft and achieved a prominence that led to significant mural contracts. In his maturity, his murals graced three U.S. state capitols (Colorado, Wyoming and Missouri), as well as numerous other public and private buildings throughout the West. Casebound copies are no longer available on this site. Please contact your bookstore or the University of Washington Press: www.washington.edu/uwpress to a purchase casebound (hardcover) copy or buy it on www.amazon.com. If you live outside the United States, please do not purchase this book via Paypal, as it is unable to calculate the postage – which is expensive. I suggest you search an online seller in your country. For example, www.amazon.uk.co sells copies.